“Did you kill anybody? – A few cops. – No real people? Just cops. While much has been said about Pablo Escobar, notorious head of Medellin’s largest drug cartel and the man with the distinction of being simultaneously featured in Forbes Magazine richest men in the world issue and also on America’s Most wanted list, this is not that movie. Much more can be gleaned about Senor Escobar’s exploits, most notably from Mark Bowden’s (2001) book “Killing Pablo,” the Netflix series Narcos (2015) or documentaries; The Two Escobars (2010); Situation Critical: Hunting Pablo Escobar or Sins of My Father (2009). In fact the audience is treated to only a passing glance of Pablo Escobar towards the end of this movie (don’t blink). This story follows Robert Mazur, portrayed with sufficient angst by Bryan Cranston (of Breaking Bad and fresh from his stint on Broadway as the 37th President of the United States, Lyndon Baines Johnson in All the Way soon to be an HBO film). While this docudrama is comparable to American Hustle (2013), a recreation of the FBI’s 1970’s “Abscam”, a pay to play scandal involving phony Arab investors (FBI agents) and politicians. In both films the audience see the humanity of each character and inevitability of betrayal part and parcel of undercover work, via an ensemble cast. In both films the acting is top notch, but the constant life or death dramas of real world undercover narcotics investigation is where the films diverge. The violent world of drug dealers and undercover law enforcement agents are made resoundingly clear as you watch The Infiltrator. 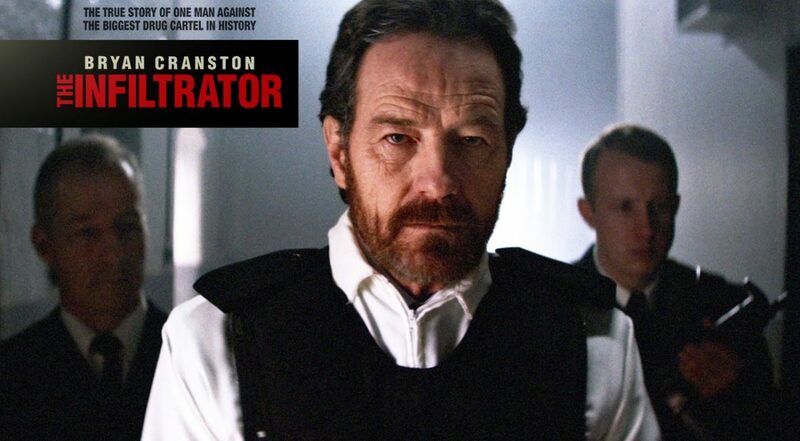 Mazur (Cranston) goes undercover as a criminal money launderer, in the 1980’s drug port of America, Miami. As the title suggests, his goal is to infiltrate Escobar’s drug trafficking network. He reluctantly teams up with fellow agent “Emir Abreau” played by John Leguizamo, who’s as natural in any role, on screen as he is on stage doing stand-up comedy. One might think that Leguizamo has had many past lives, closer to the truth is that for this actor, growing up in NYC has given him plenty of characters to mimic, some darker than others. During this film (2hr, 7min) it becomes abundantly clear that undercover work is best left to unmarried agents. The dichotomy of a domestic partner and children do not mix well with the constant threat of danger and temptations of the underworld. There is always a very real chance that a UC might lose their own identity in their criminal role and go native [ref. Donnie Brasco (1997) starring Al Pacino and Johnny Depp], but not so much in this film. Mazur is too grounded and focused, much to the chagrin of his wife, portrayed convincingly by Juliet Aubrey to stray. It is a violent world and when in Rome…well…Mrs. Mazur shockingly discovers during their anniversary dinner date the extent to which her loving husband is willing to become, as Nietzsche suggest the monster he needs to be. There are enough tense moments in this dark film to keep you wondering how it will end. And some questions as well, for example; Why is the CIA tracking Agent Mazur? What’s with the seat squirming Santeria ceremonies? Standouts performances include Joseph Gilgun as “Dominic” a convict with insight into the brutality of drug lords (ref. El Sicario the movie an book by a similar title “El Sicario: The Autobiography of a Mexican Assassin” ). Gone for a while but not forgotten are veteran actress Olympia Dukakis as Mazur’s “Aunt Vicky” who shows her nephew how a true survivor, hustler and erstwhile grieving widow can schmooze even machismo drug lords. Benjamin Bratt is always skillful in his native tongue, and especially when smoking a cigars, as “Roberto Alcaino” the linchpin to Senor Escobar. He becomes the brief recipient of Aunt Vicky’s charms. Dianne Kruger portrays a young DEA agent “Kathy Ertz” new to undercover, yet not stereotypically anxious to prove herself but rather confident in her own abilities, so much so that she goes off-script setting a wedding date for herself and Mazur, to be attended by all manner of informants, henchmen and criminal associates. Previous American films depicting the drug wars in Miami circa 1980’s like Brian DePalma’s cult classic, Scarface (1983) made so by Al Pacino, was considered too violent to receive an Oscar. The Infiltrator deserves at least a nomination. Molloy, M. and Bowden, C. (2011). El Sicario: The Autobiography of a Mexican Assassin. Nation Books: Philadelphia, PA. Sins of My Father (2009).